The rotor provides a friction surface for the brake pads to press against. Heat can negatively impact brake function. Specially designed internal fins act as a “fan” to pull cooling air through the disc. Brake pads contact the rotor and cause friction to occur. Once friction is great enough, the rotor is unable to spin and the vehicle stops. Brake pads are the primary wear point of the system, and are designed to be easily replaceable. As the brake pads wear down, the piston slowly adjusts to make sure the pads can continue to contact the rotor. The caliper bracket attaches to the vehicle and holds the brake pads in place, though still allowing them to slide toward the rotor when the brake pedal is depressed. The caliper houses brake fluid and the piston. Incoming brake fluid pushes the piston inward, causing the interior pad to press against the rotor; once the interior pad presses against the rotor, the caliper moves to bring the exterior pad in contact with the rotor. As well as providing an “anchor” for the return springs to hook around, in some instances the anchor pin can also assist or replace the wheel cylinder in keeping the brake shoes from rotating with the drum when the brakes are applied. 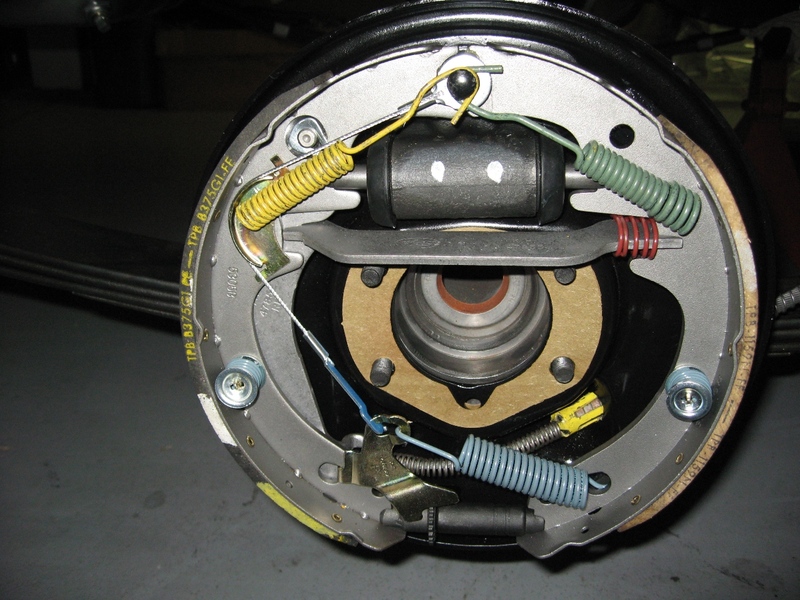 Return springs pull the brake shoes off the brake drum when the brake pedal is not being pressed. Brake shoes contact the drum and cause friction to occur. Pins and retainers keep the hold down springs in place while the springs allow the brake shoe to move when necessary. By turning an adjustment screw, the adjuster can be lengthened to ensure that the brake shoes remain a similar distance from the drum as the shoes wear down. The backing plate is attached to the axle housing and does not rotate. It holds the wheel cylinder, anchor pin, and pin. The brake drum houses and protects the inner brake parts. The inner rim of the drum is the braking surface. As brake fluid enters the wheel cylinder, it pushes the seals/pistons outward, causing the brake shoes to contact the inside of the drum. If a personal vehicle has disc brakes on the rear, a ‘mini’ version of a drum brake will often be placed inside the disc. A less common option uses a self-adjusting screw mechanism inside the disc brake pad assembly (not shown). When the parking brake, and in turn the cable, is pulled, a lever and bar assembly pushes the brake pads against the drum. Generally, disc brakes dissipate heat efficiently because the components are exposed to airflow. Brake fade (a reduction or loss in braking power) is less likely to happen. Since most of a vehicle’s stopping force is usually on the front brakes, many vehicles will have disc brakes on the front. The average cost for the drum and brake pads of a drum brake can be around 77% less expensive than comparable disc brake components. Drum brakes are well protected from outside elements and are usually less likely to corrode. Since the rear brakes often account for less of the vehicle’s stopping force, many vehicles will have drum brakes on the rear.